Overall, the potential costs associated with waiting greatly outweigh the benefits. You have a decent pot of money earning next to nothing in the bank. Frustrated, you want to invest in a diversified portfolio, but you’re worried you might buy just before a sudden market drop. Should you wait for a correction? Should you drip feed your money over time? Or should you just invest all the money now, and be done with it? Being nervous about investing a large amount of money is understandable, especially in the current environment. Merrill Lynch’s August fund manager survey shows a record percentage believe global equities to be overvalued. Almost all valuation metrics indicate the US stock market – the largest in the world – to be overvalued relative to history. It could hardly be otherwise: the ongoing bull market is in its ninth year, making it the second-longest rally in history, and stocks have surged some 250 per cent over that period. At the same time, caution can backfire. Legendary fund manager Peter Lynch once quipped that “far more money has been lost by investors preparing for corrections, or trying to anticipate corrections, than has been lost in corrections themselves”. Was Lynch right? Or is there a case for waiting out an expensive market? Quantitative expert and Elm Partners founder Victor Haghani recently investigated, his curiosity piqued by a client who had some investable cash but who wanted to wait for a correction before putting it to work. Haghani was sceptical: although double-digit corrections are common, they may happen at a much higher price point, or take so long the investor loses patience and gets “pushed in” at a much higher level. As it happens, Haghani found it is often profitable to wait. He looked at previous times where markets were expensive, defined as one standard deviation above their cyclically-adjusted price-earnings (Cape) ratio. In 56 per cent of cases, he found, stocks would have fallen 10 per cent below your entry price at some stage over the next three years. However, waiting can also prove costly. In the 44 per cent of cases where the correction doesn’t happen, Haghani found, stocks went on to appreciate by about 30 per cent – much greater than the average amount you would have saved by waiting. Haghani ran a number of other tests, tweaking the criteria regarding time horizon and correction size. He found the longer you are prepared to wait for a correction to occur, or the bigger the correction for which you are waiting, the higher the average cost. Overall, the potential costs associated with waiting greatly outweigh the benefits. If your plan is to wait for a lower entry point, be prepared to accept there’s a good chance it will cost you a fair amount of money. What about the drip-feeding approach, whereby you gradually invest your money over a period of time? Euro-cost averaging (ECA) has an intuitive appeal, in that your money buys more shares when prices are low and less when prices are high. More often than not, however, stocks rise in value; doesn’t this mean that if you delay investing your money, you will miss out on some of the gains associated with investing? Short answer: yes. A 2014 analysis conducted by New York-based Alliance Bernstein found that since 1926, stocks averaged annual gains of 12.2 per cent. If you’d invested your money over a 12-month period via fixed monthly instalments, however, average annual returns fall to 8.1 per cent. “The costs were even higher in strong markets”, the firm added. A recently updated Vanguard report, ‘Invest now or temporarily hold your cash?’, comes to the same conclusion. Vanguard looked at three national stock markets – the US, the UK and Australia – and examined the performance of a balanced portfolio consisting of 60 per cent equities, 40 per cent bonds. Investing immediately, as opposed to drip-feeding money over a 6- or 12-month period, led to better returns approximately two-thirds of the time. The results were even worse if you averaged in over a three-year period: in such instances, investing immediately won out 92 per cent of the time. Vanguard also examined alternative asset allocations – for example, 100 per cent equities, 100 per cent bonds or a 50:50 stock-bonds portfolio – but the results were essentially unchanged. Clearly, averaging into investments over time typically hurts returns, but advocates argue it can lower risk, protecting cautious investors in the occasional instances when markets stumble. One overlooked danger, however, is that averaging into an expensive stock market can backfire, resulting in more shares being purchased closer to a market top. Many strategists argue stocks are in the late-cycle phase of the bull market, but this phase can last a long time. Furthermore, recession risk appears minimal at the moment and almost none of the traditional bear market indicators are present, according to Citibank’s global bear market checklist. Accordingly, investors need to be alive to the danger that the ECA approach will result in them buying shares at successively higher prices over time, closer to the eventual market peak. Still, easing one’s money into the market beats the lump sum approach in almost one-third of cases, according to Vanguard’s study. Occasionally, in very poor markets, the savings involved are substantial. However, Alliance Bernstein’s research shows the results are asymmetrical – although ECA can save you money in poor markets, it tends to cost you a lot more in strong markets. Overall, then, the slowly-does-it approach to investing typically hurts returns. It will save you money on occasions, but not as much as it will cost you when markets are strong. ECA holds psychological but not economic appeal, although that doesn’t mean the strategy is without merit. 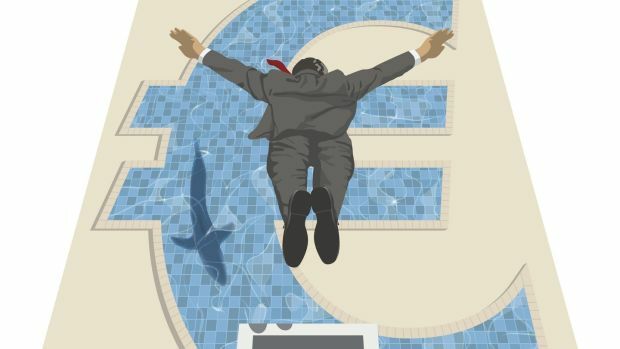 Behavioural economists have shown that for investors, the pain of a euro lost is roughly twice as great as the joy of a euro gained. This loss aversion means the mere prospect – however remote – of buying just before a sharp fall is likely to give would-be investors sleepless nights. Drip-feeding into investments over time eases this tension, and gradually gaining investment exposure will always be preferable to no exposure at all. Finally, it’s worth remembering that even if you do invest a lump sum immediately before a big market decline, time is on the side of long-term investors. In his 2015 book A Wealth of Common Sense, Ben Carlson details the case of a fictional investor, Bob, who invested only at market peaks. Bob invested $6,000 at the market top in 1972, just before stocks halved in 1973-74. He didn’t sell and invested another $46,000 in savings in October 1987; within months, stocks tanked 34 per cent. Again, he didn’t sell, and invested another $68,000 in late 1999. The dotcom bubble then burst; by late 2002, stocks had halved. Undaunted, he held on and invested another $64,000 in October 2007, just before the biggest crash since the 1930s depression.